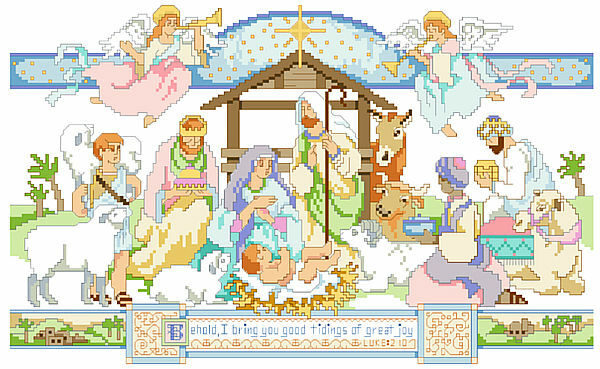 “Behold I bring you good tidings of great joy” is the text in the border of this design. 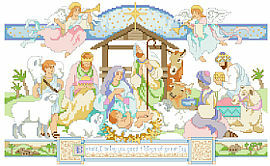 Celestial Angels are sounding their trumpets in celebration of the birth of the Christ Child. As Mary and Joseph introduce their newborn son to the world, the three Royal Magi and the humble shepherd kneel in reverence. Contents: Stitch Count 196w X 120h Finished Size on 14ct - 14" X 9"